What do 1920s gangster John Dillinger, actor Johnny Depp, and firm co-founder John Houseal have in common? This week, Houseal Lavigne Associates moves into its new home on the second floor the Randolph Tower, located on the corner of Randolph and Wells within Downtown Chicago. Here are some fun facts about the historic skyscraper, formerly known as the Steuben Club Building. It’s a cathedral in the sky. The Steuben Club Building (1929) was designed in the gothic revival style, an architectural flavor that became re-popularized in the early 20th century. The style co-opted medieval design elements and applied them to the skyscraper in a manner that emphasized verticality. 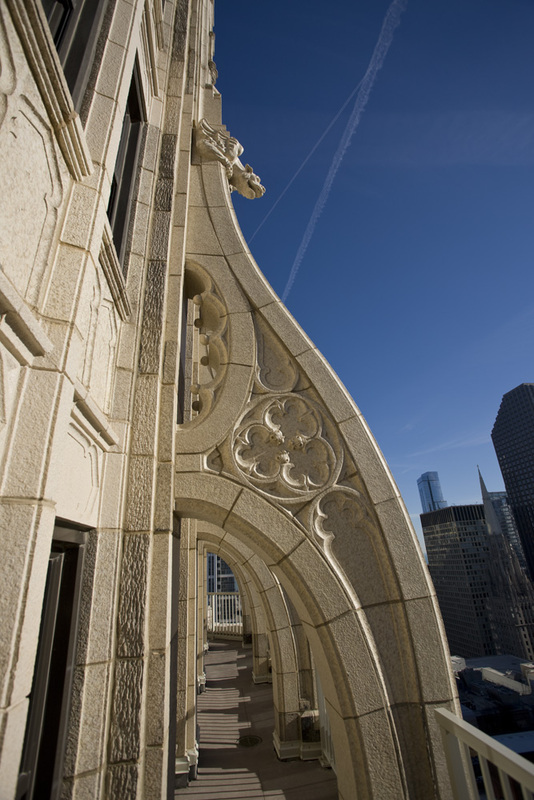 The 45 story building contains pointed arches, gargoyles, quatrefoils, and stylized buttresses commonly found in cathedrals. It’s a symbol of a German-American patriotism. German-Americans migrated to Chicago in droves in the 19th and early 20th century. 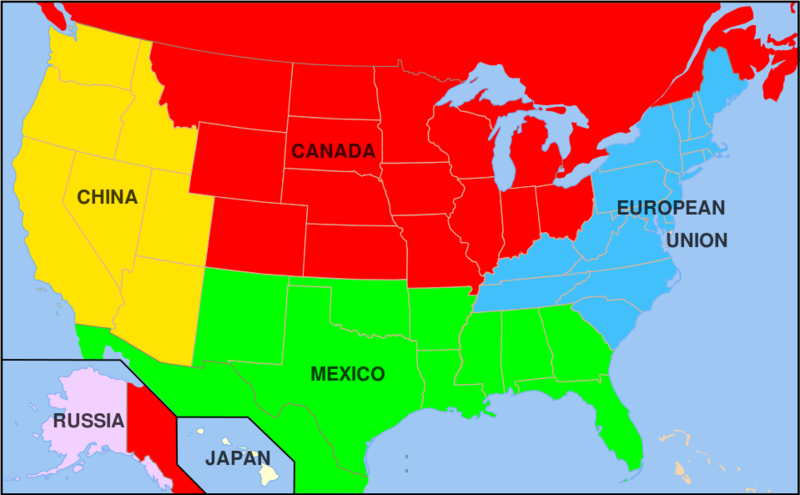 During and in the years immediately after World War I, however, many Americans questioned their loyalty to the United States. The Steuben Club was formed to provide a respectable social and civic organization for German-Americans. Needing a distinctive headquarters, the group financed construction of the Steuben Club Building, which was completed in 1928. It contained an ornate dining room, recreation facilities, office space, a swimming pool, and more. 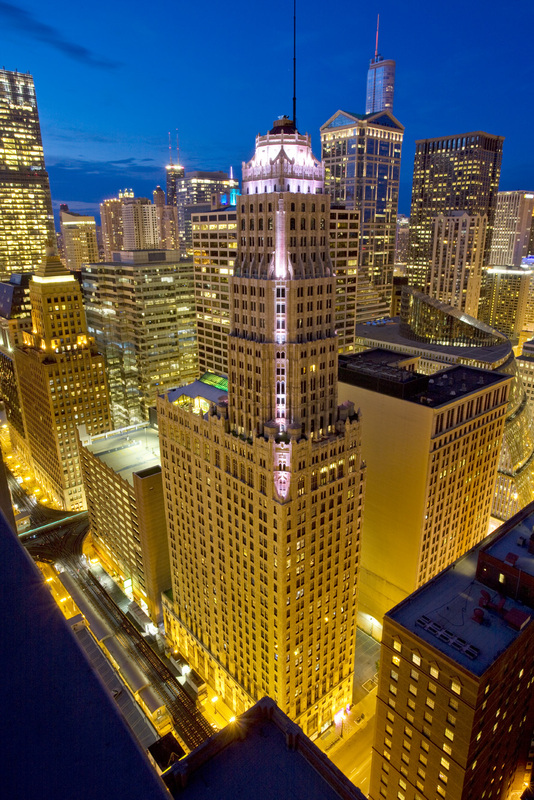 Its distinctive shape was influenced by Chicago’s landmark 1923 zoning code. The Steuben Club is essentially a spyglass-shaped tower above a large box. Afraid of creating dark canyons, the City passed a 1923 zoning code to regulate the height and volume of buildings. 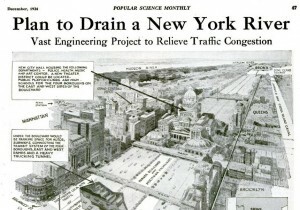 This had a significant effect on the design of Downtown Chicago, introducing the usage of setbacks and slender towers above the main mass of the building. Take a closer look at the historic skyscrapers within the North Loop, such as the Jewelers’ Building (1927), Wrigley Building (1924), or Mather Tower (1928). All have this “base + tower” massing with a fairly consistent cornice line. It was a hangout for the prominent 1920s gangster, John Dillinger. Dillinger once dated one of the coat check-girls who worked at the Steuben Nightclub, and he was a regular in the building during their courtship. The building’s former Steuben Nightclub was depicted in the 2009 film “Public Enemies,” with Johnny Depp staring as John Dillinger. It’s a fantastic example of adaptive re-use and is now the home of Houseal Lavigne Associates. 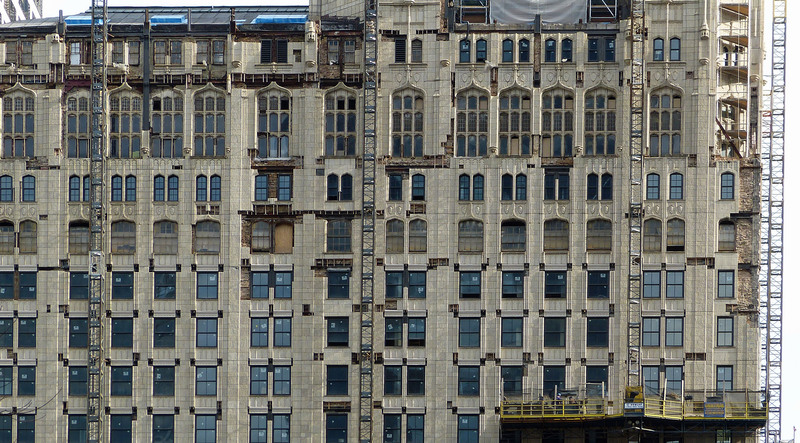 By the end of the 20th century the building had fallen into disrepair, with chunks of terracotta falling off of the façade onto the “L” tracks. Its unique floorplate and lack of modern amenities made it difficult to market. However, with the resurgence of interest in living downtown, the building was ideal for conversion into residences, with office and dining uses on the lower two floors (and Houseal Lavigne occupying part of the second floor). A $148.2 million dollar rehab completed in 2012 has brought back the building’s glory, and today it stands as proud as it did in 1929. The Randolph Tower, formerly the Steuben Club Building, is one of Chicago’s most distinctive 1920s gothic revival skyscrapers. The historic building utilizes many gothic design elements, such as quatrefoils, buttresses, gargoyles, and pointed arches. By the end of the 20th century, the Steuben Club Building fell into extreme disrepair. Millions of dollars were spent restoring the terracotta cladding. 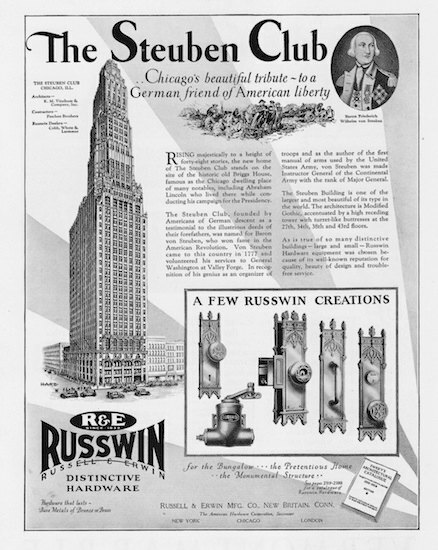 This advertisement shows the Steuben Club Building as it looked upon opening. The 1920s advertisement is for Russwin Hardware, which supplied door hardware for the building. The Steuben Club Building was a regular hangout of gangster John Dillinger. 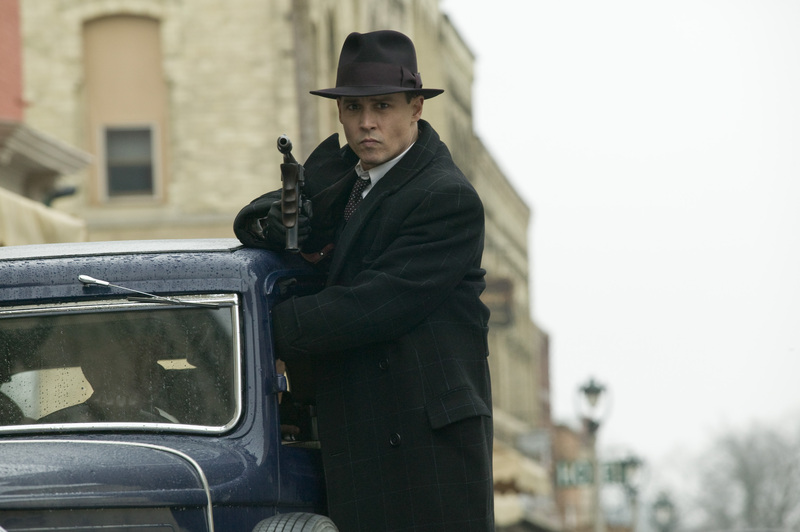 A 2009 movie, Public Enemies, featured Johnny Depp as Dillinger and depicted the building. Being good at something does not necessarily make you an expert. As my husband and I watched my beloved Golden State Warriors take on the Cavs in the NBA finals, my husband mentioned how weird it was that Mark Jackson was commentating on the game. 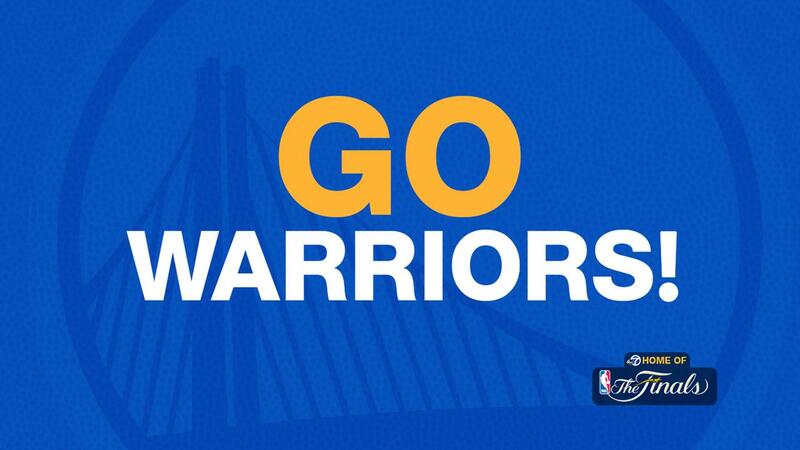 Just the year earlier he was coaching the team, and he was mediocre at best (he did, however, lead the Warriors to the playoffs for the first time in 17 years, but he also had the Splash Brothers). Jackson was a great player, but as a coach, he couldn’t lead his time to the finals. As a coach, he was doing it wrong. Using sports analogies got me thinking: what make a planner an expert? Planners generally go to planning school where they learn about common issues, and learn strategies to solve these issues by applying planning theories. Does getting an “A” in an Economic Development class mean you’re an expert? 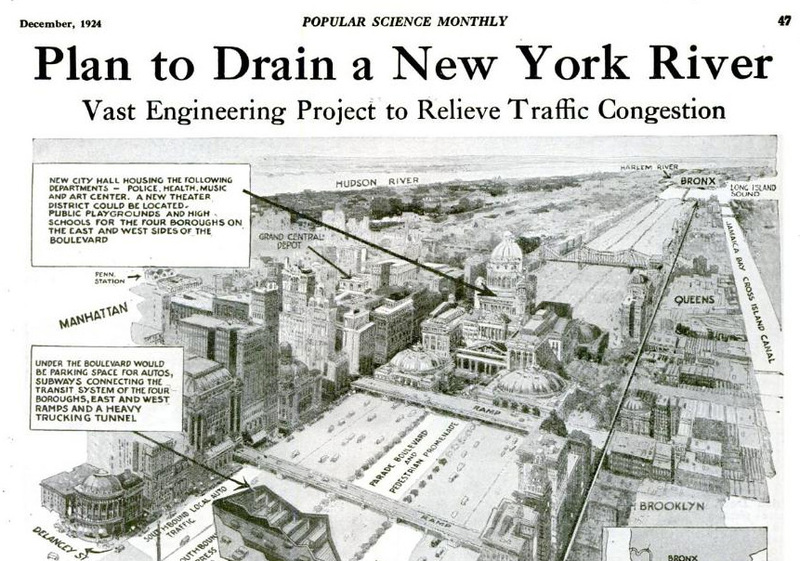 Robert Moses and Pruitt-Igoe have shown that past “experts” did it wrong. A planner that knows a lot about planning theory and was academically successful is NOT an expert. Planning, to be successful, takes a team. We rely on community members, city staff and officials, and motivated stakeholders and community leaders. Much like Steph Curry needs Clay Thompson to be the Splash Brothers and Steve Kerr has effectively used all the players on his team, planners need a team of people, which should include other planners, to be successful. Expertise comes from a broad understanding of issues and the exchange of ideas for possible solutions. The swim coach at the gym should have watched how other coaches work with different swimmers. She should have consulted with the kid’s parents to understand the best way to communicate with him. She cannot be a good coach without having a community of people helping her understand what coaching techniques could make this specific boy a good swimmer. Similarly with planning, without out a community-based approach that combines known planning strategies, we could not be considered experts; we’d be doing it wrong. There is a renewed commitment within cities across the country to make it safer and more convenient to get around on a bike. Dedicated on-street bike lanes are an important component of this effort, together with strategies that include bike sharing programs, sharrows, better bike safety and awareness programs, and so on. However, once bike lanes are provided for cyclists, are they property protected for their intended use? It is not uncommon for police to issue warnings or tickets to cyclists and skaters for riding in areas where such activity is prohibited. In fact, the ticketing of cyclists is on the rise as the popularity or urban cycling increases. However, is there a rise in the number of tickets being issued to those who obstruct the bike lanes? Maybe cities should focus their efforts on ticketing those that prevent the bike lanes from being used as intended. In this short video, Casey Neistat humorously and painfully makes a good point regard the ticketing priorities of cities and the challenge of navigating the unintended urban obstacle course. I have two kids under the age of 4, so with the recent bout of super cold weather, I have been watching more than my fair share of “family movies”. These include the usual Disney hits as well as several films featuring the Muppets that I have now seen dozens of times. This past Sunday, as I sat cutting up hotdogs into bite size portions, The Muppets rendition of We Built This City came on. As an urban planner, I have always found this song amusing, but never given the concept much thought. 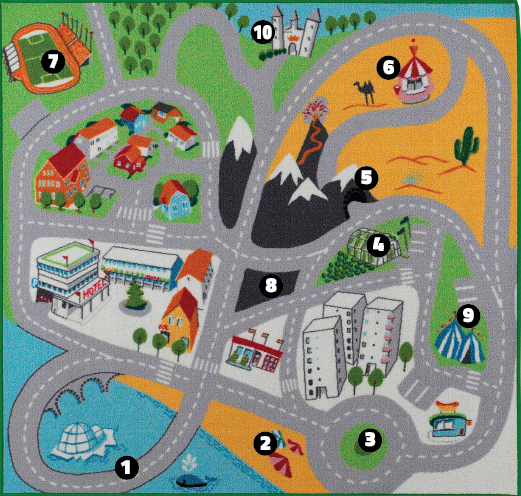 For some reason, as I watched Beaker chirp in fear as he ran from a vacuum in tune with the music, I realized that building a city on rock ‘n’ roll would probably be a horrible idea. The song is from the Starship album Knee Deep in the Hoopla (No I am not a total ‘80s nerd, I googled this), but it is more likely that the band’s Rock ‘n’ Roll City would be knee deep in something else. If hanging out with some of my musically-inclined friends has taught me anything, “rockers” are not the most reliable at anticipating needs of others beyond the next round of beer (at best). Building a city on rock ‘n’ roll would undoubtedly result in a reactive (not proactive) approach to infrastructure development with roads, water, and sewer going in wherever the next band decides to drop its gear. As Rock ‘n’ Roll City grows, insufficient capital improvement funding and capacity issues would likely result in frequent boil water alerts and a not-so-attractive riverfront where an overburdened combined sewer system found its course (“One pipe should do it right? Yeah, let’s go jam”). And, if we can build a city on rock ‘n’ roll, surely there must be others building cities on country, or R&B, or punk, or jazz, or classical… The point is you can’t have a reliable tax base if its built on a single industry. As soon as a couple big bands leave or retire (please don’t do it yet Rolling Stones), your tax base is in peril and you’ve got out of work musicians considering workforce development programs to target band openings in other communities. Sure, Dubstep City is booming now, but if it doesn’t diversify, it becomes tomorrow’s Hair Metal Town. Then there is the Guitar Center vs. local music guy debate. Yes, despite the anti-commercialism bent in Starship’s hit song, big boxes would still probably exist in Rock ‘n’ Roll City. There is a growing fear that “the man” will squeeze out small shops without proper planning. But what should be done? A specialized district with incentives for small businesses? An outright ban on any new big boxes? Is a white elephant ordinance needed for when Guitar Center decides to expand and move down the street? The solution that is right for Jazz Town or Country Village may not be the right fit for Rock ‘n’ Roll City and targeted community outreach, complemented by market research, will be needed. The smoke hazed debate at the coffee house/city hall continues. What are cities really built on? The point of all of this is not to shame those who truly love Starship’s ‘80s pop classic (you know who you are). 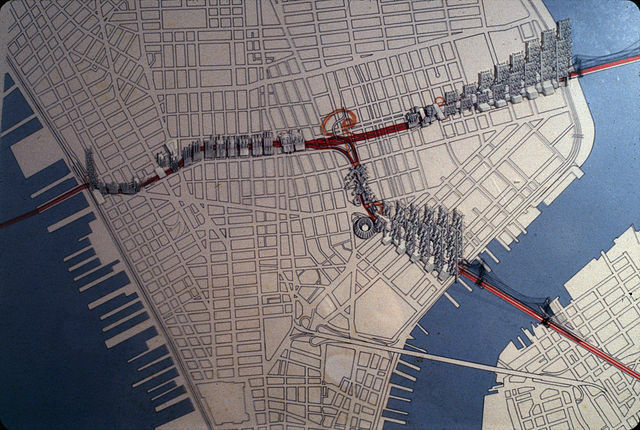 It is to underscore that cities are complicated organisms. As planners we must balance the desires of a diverse group of stakeholders (not just rockers) with the resources available and our knowledge of best practices and what has worked in other communities. The next time you hear We Built This City, or another smash hit from Jefferson Airplane/Jefferson Starship/Starship, hopefully it reminds you that a lot goes into creating and maintaining the quality places in which we live and work. And hopefully you can hit skip. If you haven’t already seen this music video, you’re welcome! What if Hot gets too Hot? I spent part of the holidays in the Cincinnati region and visited some of the most rapidly redeveloping urban neighborhoods in the nation, generally north of the city’s traditional Central Business District (CBD), although there are a number of places Downtown experiencing a lot of reinvestment as well. 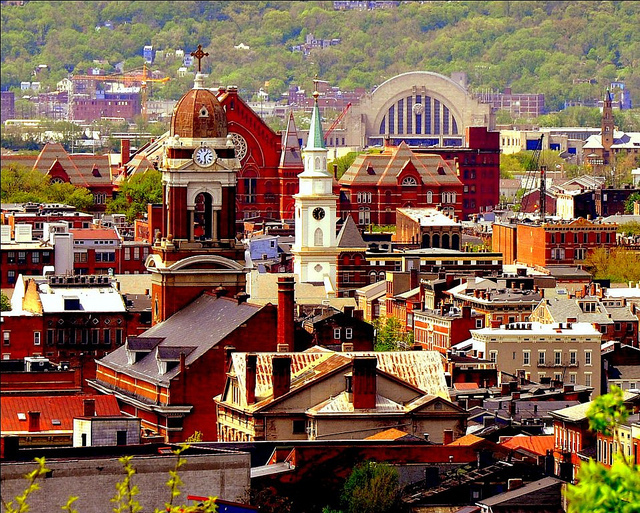 Over the Rhine (commonly written as OTR) is a national treasure, containing the largest amount of Italianate architecture in the United States and with nearly 1,000 contributing structures, it is believed to be the largest, most intact urban historic district in the country. This neighborhood, originally settled by primarily German immigrants and home to a major pre-prohibition brewery district, covers dozens of city blocks and is one of the U.S.’s most well preserved historic areas, often cited as possessing a similar character to New Orleans’s French Quarter or historic Charleston, South Carolina, although distinctly early-American in style. 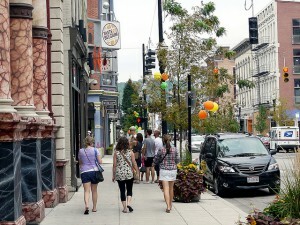 Once the location of some of the most persistent blight in the metropolitan region, OTR has now transitioned into an area experiencing rapid reinvestment, creative adaptive reuses and renovations, and even major infill development, including a recently announced $75 million multi-phase project. OTR has helped link existing regional assets, like the University of Cincinnati, Findlay Market, and Cincinnati Music Hall, to the CBD, traveling along Vine Street and feeding other areas of recent redevelopment, like Fountain Square in the heart of Downtown as well as to the Banks project on the riverfront, situated between the Reds and Bengals stadiums. Recent investments include adding a bicycle sharing program called Red Bike, a streetcar line slated to open soon, and a $48 million renovation of Washington Park in OTR, which reopened in 2012. By all accounts OTR is one of Cincinnati’s recent success stories and garnered the city deserved national attention. But while I was there, a local newspaper article documented an experience I’ve navigated a handful of times before – the article dubbed it “restaurant roulette.” Simply, OTR’s success has become so widely known throughout the Cincinnati region, even to the point of drawing out-of-towners like me whenever I’m visiting, many of the quaint restaurants that line Vine Street post 2 to 3 hour waits for a table; further, many do not take reservations. The idea of “restaurant roulette” is to then split up your dinner party and place your name on multiple restaurants’ wait lists simultaneously, and then take the first one that opens up – even then, the waits can be long and the strategy has created complications and frustrations to both diners and proprietors alike. This phenomenon made me think about OTR’s unique (and rapid) success story and the interesting dynamic that just about the same amount of startups and small businesses actually fail at their first significant period of rapid growth and expansion as they do in their early, fledgling stages. Simply, growth often smothers a rapidly growing small business, not the lack of customers. I see similarities with a new startup venture and a neighborhood revitalization effort like OTR. The earliest examples of reinvestment started small, carried the highest degree of risk, and in the short-term, were a bit of a grind with low rewards. Then seemingly one day everybody knew about OTR and everybody – whether a business owner, or real estate developer, or consumer – wanted to be a part of that success. OTR now faces growth management as one of its central challenges. 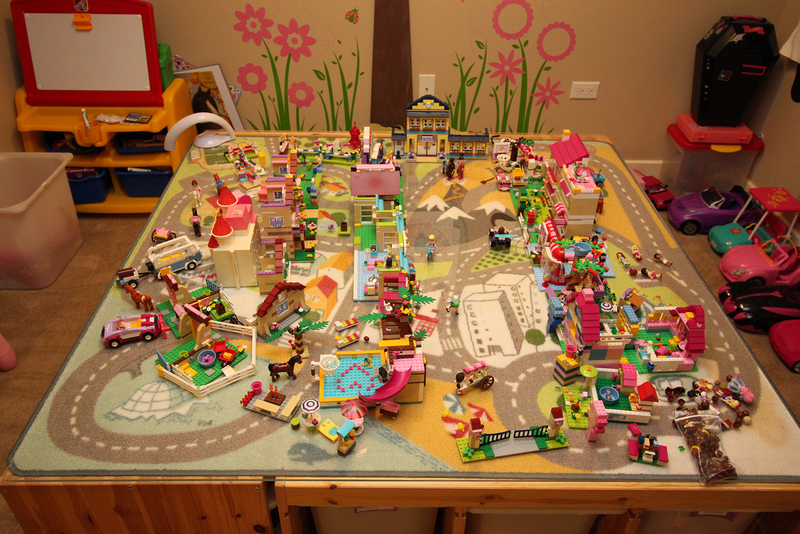 So what role does urban planning play in ensuring continued success in this situation? 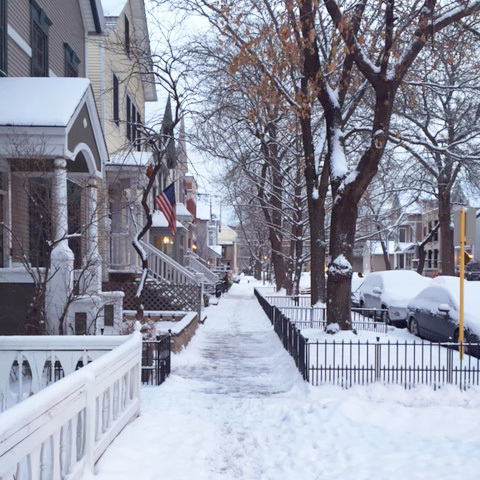 Planners do often work with the consequences of fast, uncoordinated growth and how the short-term benefits may not outweigh their long-term negative impacts (i.e. 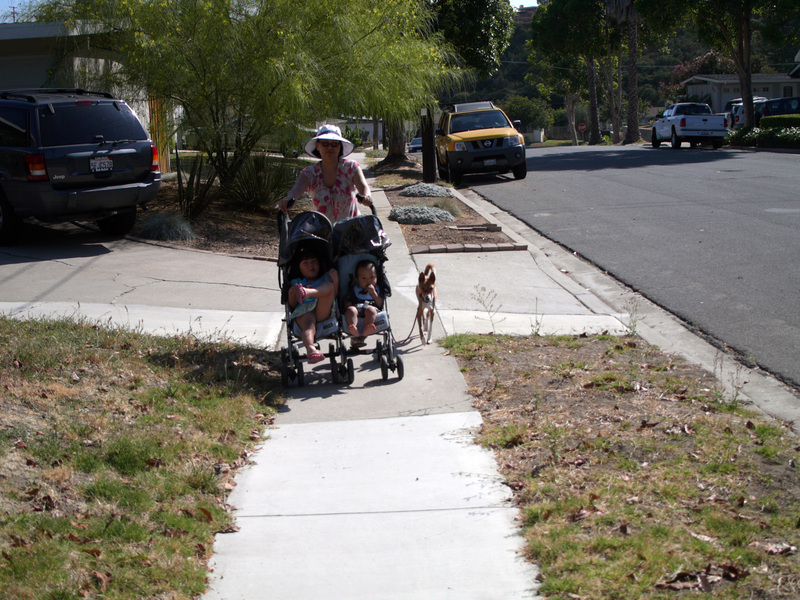 an unbalanced land use mix and its tax burden impact on homeowners). But we typically address this dynamic in rapidly developing suburban or exurban areas that are churning through greenfields and farmland. But these challenges carry a lot of similarities – how can OTR continue to develop, but do so strategically in a way that preserves its recent successes and builds on those accomplishments? How does it handle unique challenges, such as a nationally-precious but finite supply of historic structures, and ensure that each project is professionally completed with a focus that maintains past quality? How can the community balance the demand for more restaurants and more projects more quickly, against ensuring that future projects are not done so focused on the short-term, they ultimately undercut the long-term viability of the neighborhood?